Today I will show you how to draw a cute cartoon penguin from the number “12”. 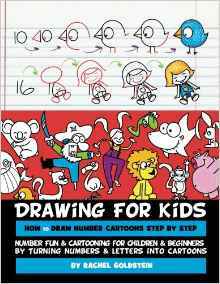 This is a simple to follow drawing lesson that your children will find easy to follow. This tutorial is broken down into many easy-to-follow steps. Have fun and Happy drawing! (Step 1) Write the number “12”. (Step 2) Turn the top of the “2” in the “12” to a circle. (Step 3) Draw a dot in the circle to form an eye. Draw a slanted line at the bottom of the number “2” to form a triangle beak. Make the “1” longer. (Step 4) Draw a letter “u” shape for the wing. Draw a line in the beak. Draw a line below the beak. (Step 5) Draw a letter “M” shape for hair. Draw a sideways “D” for the foot. (Step 6) Draw a backwards “#7” for the rest of the hair. Draw a curved line for one of the toes. (Step 7) The penguin is done unless you want to color him in.